If you have any questions regarding Criminal Defense, please contact us for a FREE CRIMINAL PROPERTY OFFENSES CONSULTATION. Theft is sometimes used as an umbrella term encompassing larceny, burglary, embezzlement, looting, and similar crimes. 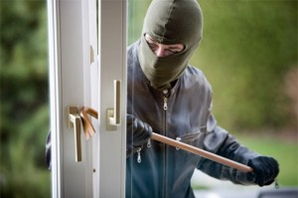 A person commits a home invasion crime when, without authority, he or she knowingly enters a home of another, when he or she knows or has reason to know that the home is occupied, and intentionally causes a crime within the dwelling. Simply threatening to use force against an occupant of the invaded home may also be sufficient to trigger the home invasion charge. Burglaries of homes that are committed when the occupants are present are considered home invasions, and are usually punished more severely than other burglaries. Use of a weapon in the course of a home invasion will draw the most severe criminal penalties. Robberies is illegal taking of property. Robbery is a type of theft distinguished by the use of force, intimidation, and/or violence to seize someone elses property. Armed robbery refers to a specific type of robbery that involves the use of a weapon, a replica of a weapon, or the pretense of having a weapon. An armed robbery charge is one of the most serious charges an individual can face and may be filed in conjunction with illegal possession and/or assault with a deadly weapon charges. If you need an effective Criminal Defense Attorney, please contact us for a FREE CRIMINAL PROPERTY OFFENSES CONSULTATION.